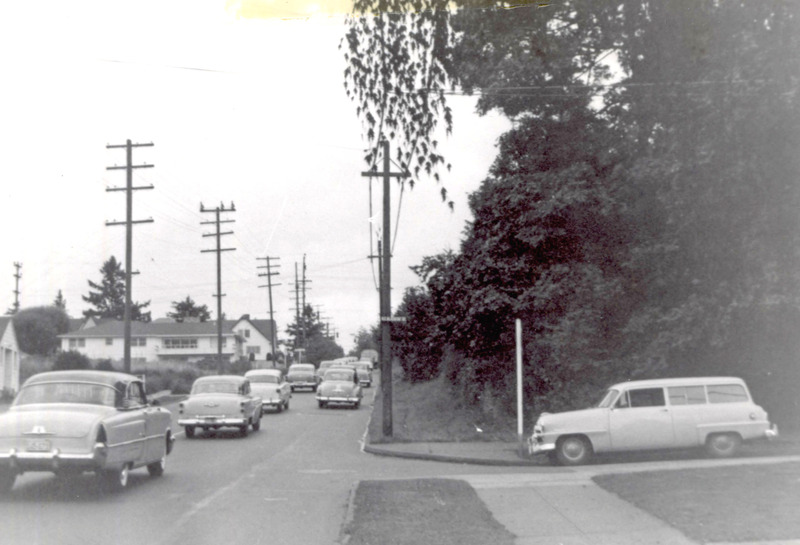 Check out this view looking north up the hill at NE 33rd and Fremont–Gravelly Hill–taken at Klickitat Street in 1954. Photo Courtesy of City of Portland Archives, image A2005-001.955. Click for a larger view. Two lanes of traffic northbound, and those were the days of the wide-body car. And you think it’s a tight fit today! Have a good look around and you’ll see the house on the southwest corner, a Roman-brick ranch with swimming pool that collapsed in the late 1980s and early 1990s. You’ll also see that the brush and trees on the east side of the street are still there, just a little bigger today. Street signs have changed style since then. The upslope houses on the west side of the street haven’t been built yet. Way back, this was the summit of Gravelly Hill, a one-time gravel pit and garbage dump for east Portland. The contributing factor to the demise of the former home that occupied the southwest corner was the underlying instability of the slope due to the gravelly soils and the not-fully-compacted refuse the house was built upon. We’re working on a careful look at the history of Gravelly Hill and found this photo fascinating. Believe it or not, we’ve found news stories in The Oregonian from the early 1900s that refer to fox hunts (as in social groups of people on horseback with dogs riding about the countryside) that began and ended at the base of this hill. Farmers and fruitgrowers tilled the soil here for a generation perfecting new breeds of strawberries and apples. Boxing matches were held out this way, far beyond the edges of the city, in a barn perched on the hillside. And residents who wanted more space around them lived and died out here in the country where they could appreciate the view from Gravelly Hill. Let’s just say that it’s a hill with a lot of history. And today, just like half a century ago, it’s still a busy intersection, one of the neighborhood’s most dangerous, and one of our least favorites. With thanks to the Stanley Parr Archives at the City of Portland for this photo from the past. I remember the house on the SW corner of 33rd & Fremont; it left sometime after we moved back here in 1995. I didn’t realize there were collapse issues going on. Didn’t the house get moved by Emmert, and revamped as the base of a Street of Dreams house somewhere on the west side? Or am I just dreaming that part? Thanks for this photo. It looks like the photographer may have been standing on the sidewalk in front of my aunt and uncle’s house–or darn close to it.